Lord, let me blend in with the wall! 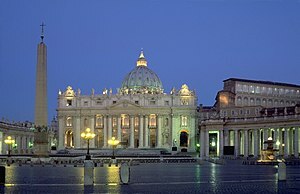 St. Peter’s Basilica at Early Morning (Photo credit: Wikipedia) P.S. This wasn’t the church I was at! When my youngest was born, she made her first church appearance just a few days later. Being understandably tired, we didn’t make it to our usual Mass, but went to an 11:00 a.m. at a church I’m not as familiar with. The baby slept wonderfully through Mass until just before the end. When she began to cry, I picked her up and looked around for a private hidey-hole in which to discreetly feed her. Then I spotted a folding chair in a dark corner, far from any people. Perfect! Now, mom, when I make this sound, I want you to….